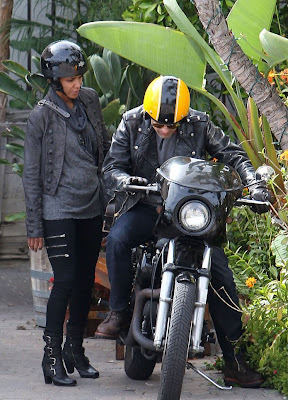 Halle Berry and her boyfriend Oliver Martinez hop on his Harley Davidson motorcycle after having brunch at Geoffrey's on Sunday (October 24) in Malibu, California. The night before, the couple made their first public appearance together on the red carpet for the 32nd Anniversary Carousel of Hope Gala. Earlier this week, Halle took her adorable daughter Nahla to pick out a pumpkin for Halloween. The 2 year old cutie even got her face painted! FYI: Halle is wearing her Charley 5.0 denim leggings, looking the very picture of perfect biker chic. Want some? Get em at Ambience.